Welcome to the Pretty Things website. 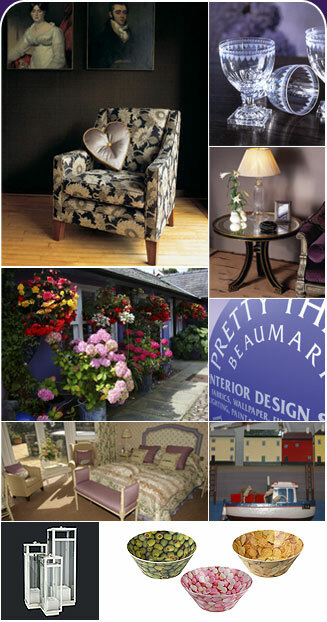 Pretty Things is a small company that can provide the highest level of professionalism, knowledge and experience. Our Interior Design service provides a complete design consultation service including the supply of fabrics and wallpaper, curtain making & hanging, colour schemes, planning, paints and lighting. These items may be indepently purchased. The website is directly linked to all our major suppliers. Why not browse through the varied and colourful world of No. 6, our famous Gift Shop where we stock a wide range of modern and traditional gifts from jewellery and photo frames, candles to childrens gifts. We are one of the leading suppliers of William Yeoward Crystal, having been suppliers of their products since its conception in 1995. We are also proud stockists of Emma Bridgewater products. Our lighting department houses some of the finest lights from the leading manufacturers. In the furniture section we have a wide range of upholstered sofas, chairs, tables, glassware and mirrors again from all the major furniture manufacturers. Why not combine your visit to Pretty Things with a visit to the historic and picturesque town of Beaumaris and the spectacular Beaumaris Castle, a designated World Heritage Site.